Powder Toy is a physics simulation game. You can grab a version (Windows, MacOSX and Linux) of Powder Toy HERE. 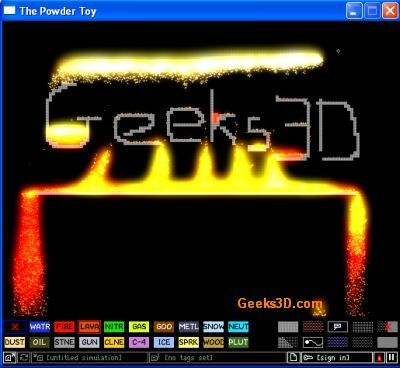 You can download The Powder Toy HERE @ Geeks3D.com. Try it, it’s really funny! I think an OpenCL version of Powder Toy has been used in this AMD demo. It run’s realtime on my 9600mGT so i don’t need 6×4 AMD system. I think this version is only based on the CPU so the GPU isn’t important. This tiny game is awesome!! It runs smoothly on my Athlon64 2.2GHz single core too, so what. i cant download it or get onto the home website (http://powder.unaligned.org) its as if its not connecting or something. sll my mates have this problem too. anyone got another site where i can download this from?? i REALLY want to play it!!! I think the website (powder.unaligned.org) is down. If anyone has any info on when it will be up that would be great. i don’t know when there going to put it back up again. they took it off because this one kid in my school played it and it caused a virus in the whole school. i know how to get it back. put it on your flash drive from one computer and then put in another and then like baaaaaaaaaaaaaaaaaam you have it.!.!.!.!.! It’s really gay that we can’t play it at school anymore. I love that game. I can barely ever play that game at home. I’m so pissed.